It's been a cloudy and cold week so far for most of the area with temperatures having a difficult time getting anywhere close to normal of late. This after last week's well-above-average temps and nice spring weather. The big picture is about to change again as the upper-level pattern undergoes transition and we get back to a more spring-like regime. This will mean warmer weather, but also greater chances of strong to severe thunderstorms as cold fronts will be more potent and will be able to work with warmer and moister conditions as they arrive. I expect conditions to moderate Friday and last right through the weekend as temps climb to near 70 on Saturday and near 80 on Sunday. The next big weather-maker (following tonight's rain-producing disturbance) will be a strong cold front and low pressure system that will affect the Mid-South on Monday and Tuesday of next week. Though it is still several days out, we are definitely looking at the possibility of all modes of severe weather with this system, especially Monday night. We'll continue to keep you updated through the next few days, but just bear in mind that while temperatures near 80 might feel very nice, at this time of year they are likely to mean the threat of severe weather. Severe weather outlook areas - day 5 is Monday and Monday night. For the complete MWN Forecast, click here. 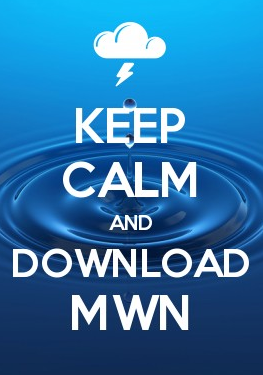 It's also a good time to sign up for severe weather alerts from MWN. You can sign up for any metro county by clicking here or just follow @shelbyalerts on Twitter for alerts specific to Shelby County. Lastly, don't forget to download our new iPhone app! 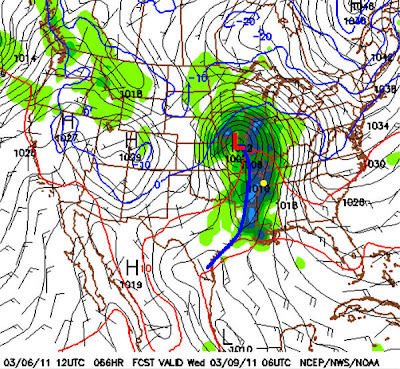 It's got the latest conditions, MWN Forecast, StormView Radar and more packed into the convenience of an iPhone. First off, in traditional situations, there must be a thunderstorm and it's rising currents of air present for hail to be produced. The dynamics within a thunderstorm, including the upward motion of air (or lift) is a necessary ingredient. Hail begins small in storms and grows through a process of ascending and descending in the storm through sub-freezing air. Rising air in a storm, sometimes at a very fast rate, throws the hail higher into the storm. It subsequently gets heavier due to accumulating more ice around the core of the hailstone and descends. Stronger gusts of rising air can push it back up which cause it to accumulate another layer of ice, and the process it repeated. 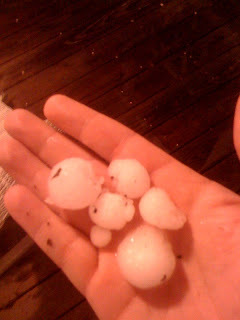 The more times the process is repeated, the larger the hailstone. A good animation of the process can be found here. 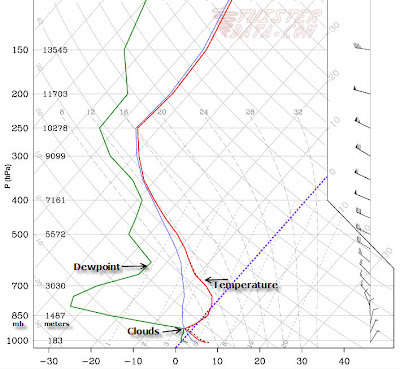 Another important factor is the freezing level, or what height above the ground the air drops below 32F (0C). Liquid droplets must be present above this levels to produce ice, and hailstones must rise above this level to continue to accumulate more ice around the core. In addition, if the freezing level is very high, the hail will melt on it's way to the ground and shrink in size, or melt completely. 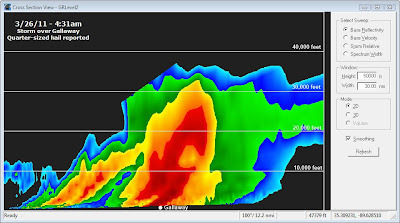 For the largest hail to reach the surface, optimal conditions are a strong thunderstorm with strong updrafts and a low freezing level (near 10,000 feet or less in the Mid-South). Let's take a look at the storm from last night. The first image below is a cross-section of the storm at 4:22am from the Millington NEXRAD radar. Left to right is roughly west to east (so we are looking north in this image) and bottom to top in the image is increasing altitude (or going up in the sky). Each horizontal white line is 10,000 feet. The brightest colors (reds and purples) are the heaviest rain, or in this case rain and hail. 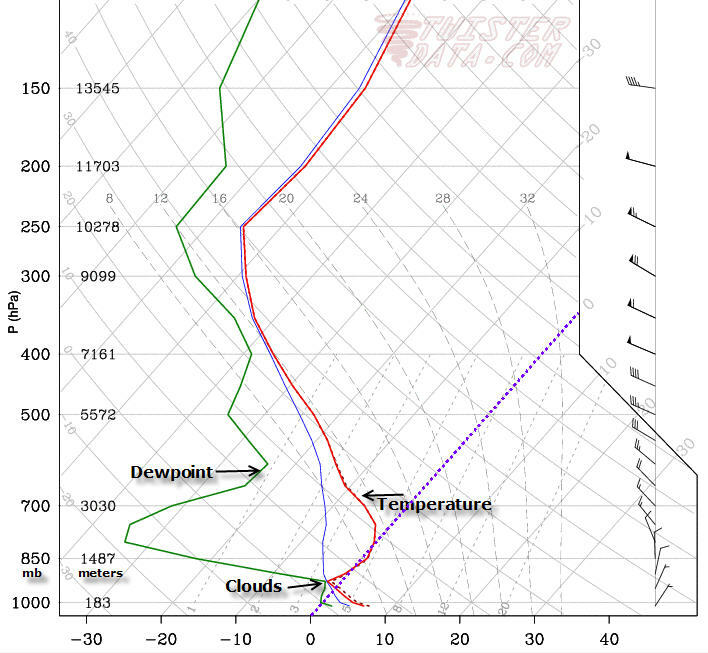 The freezing level last night was fairly favorable at about 11,000 feet. So, any heavy precipitation you see above that level is likely freezing/frozen. 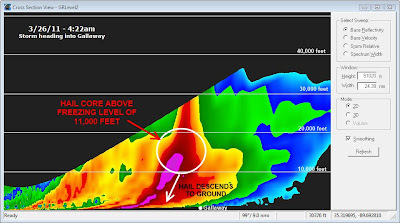 In the image below, hail resides in the white circled area, and actually are being thrown up to even higher levels in the reds between 20,000-30,000 feet. Gallaway is labelled and the storm is moving from left to right, so the storm has not quite reached there yet. Note that nearest the ground, the color above Gallaway is green, or light rain, but the storm is tilted from west to east by upper-level wind and the strongest precipitation (reflectivity) aloft is almost over Gallaway. In the next image, taken at 4:31am, the color nearest the surface directly over Gallaway is red and that red extends up to about 25,000 feet. Hail is now falling at Gallaway, though the storm has weakened a little, as evidenced by the pack of purples. 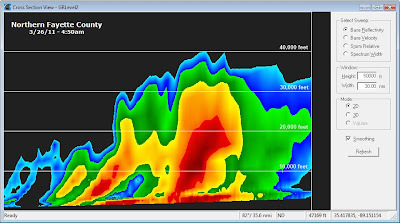 The darkest reds are now below 10,000 feet and there is much less red between 10,000-25,000 feet, indicating that the storm is in the process of collapsing, the updrafts are weakening, and the hail suspended aloft is falling to the ground. Twenty minutes later (4:50am), in the last image below, the process appears to be starting over again as plenty of heavy rain and probably some hail is reaching the ground, while another core of heavier precipitation is forming between 5,000-20,000 feet above the ground. This is the nature of the thunderstorm beast, continuing to mature and dissipate repeatedly until an unfavorable atmosphere is encountered. So what did this storm produce? The picture below, sent by Cam Fondren of Gallaway, tells the story - hail, some of it qurater-sized (1" diameter), which verifies the Severe Thunderstorm Warning that was is effect for Fayette County when the hail fell. Special thanks to Cam for sending the picture! 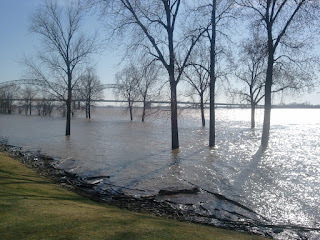 The winter of 2010-2011 is officially over, both meteorologically (on February 28) and astronomically (on March 20), so now is a good time to go back and review what Memphis and the Mid-South dealt with during this La Nina winter. For this post, I'll define winter using the meteorological period of December-February. Referring back to late last fall, I wrote a post on the expected conditions for this past winter. Due to a consensus among many organizations that La Nina would dominate the weather pattern throughout the winter months, I predicted a warmer and wetter winter than average, with an increased risk of a severe weather outbreak not unlike to the La Nina winter of 2008. How did it turn out? Well, La Nina existed, but was overshadowed by a fairly strongly negative North Atlantic Oscillation (NAO), which allowed colder than normal weather to exist across eastern North America. The balance between La Nina and the negative NAO resulted in temperatures that started off very cold in December, but warmed some in January and February, thus an average winter temperature of 42.1 degrees, which is slightly below the average of 42.7 degrees. In terms of precipitation, despite some significant snowfall (more on that in a minute), drought conditions from late fall persisted into winter and Memphis ended up with just over 50% of normal winter precipitation. The total was 7.37" of liquid precip versus an average of 14.23", ranking this winter as the 8th driest on record. The severe weather threat never really materialized this winter, other than on February 24th when strong wind ripped through the metro area with a line of thunderstorms, causing damage in parts of the region. While a great deal of snowfall was not expected, the Memphis area experienced a third straight snowy winter. The total snowfall at Memphis International Airport was 9.7", which was the most since 1987-88, with six days of measurable snowfall, the most since 1984-85. This is 6.1" above the normal of 3.6". 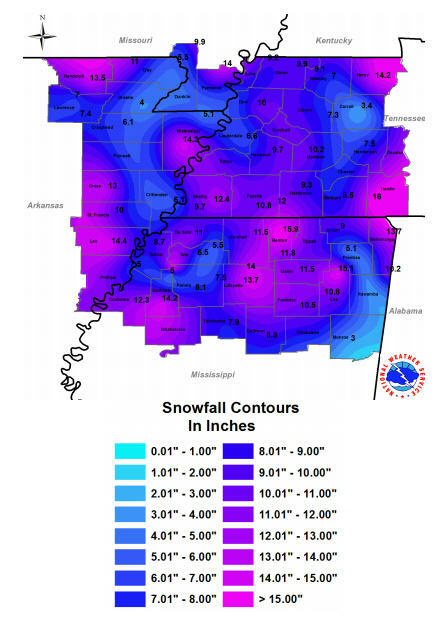 Below is a graphic courtesy of NWS-Memphis showing winter snowfall totals across the Mid-South. More details on the recently completed winter season can be found in a National Weather Service review. HUMIDITY...THIS IS CREATING DANGEROUS FIRE WEATHER CONDITIONS. THESE CONDITIONS ARE EXPECTED TO PERSIST FOR THE NEXT FEW HOURS. THE EXPANSION AND EXTENSION OF THE WARNING. WARNING...WHICH IS IN EFFECT UNTIL 9 PM CDT THIS EVENING. FOR A DANGEROUS FIRE WEATHER SITUATION. So, especially if you live in rural areas, please take this in consideration before burning brush or debris. Conditions are favorable for that small fire to get quickly out of control. More information is available on Wikipedia. * FROM TUESDAY EARLY AFTERNOON UNTIL FURTHER NOTICE. * AT 9 PM MONDAY THE STAGE WAS 33.8 FEET. The river has been rising for the past few weeks as snowmelt and recent heavy rain upstream have caused the tributaries feeding into the main rivers to rise (see our blog post from early March on the subject). 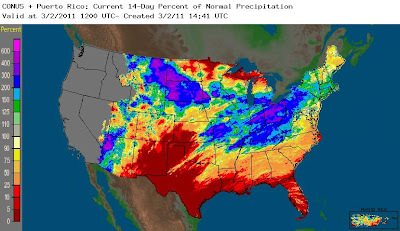 This is a fairly normal occurrence in the spring, but due to heavier snowfall in the northern U.S., flooding will likely affect large areas to the south. This will be especially true for agricultural land inside the mainline levees around and downstream from Memphis. 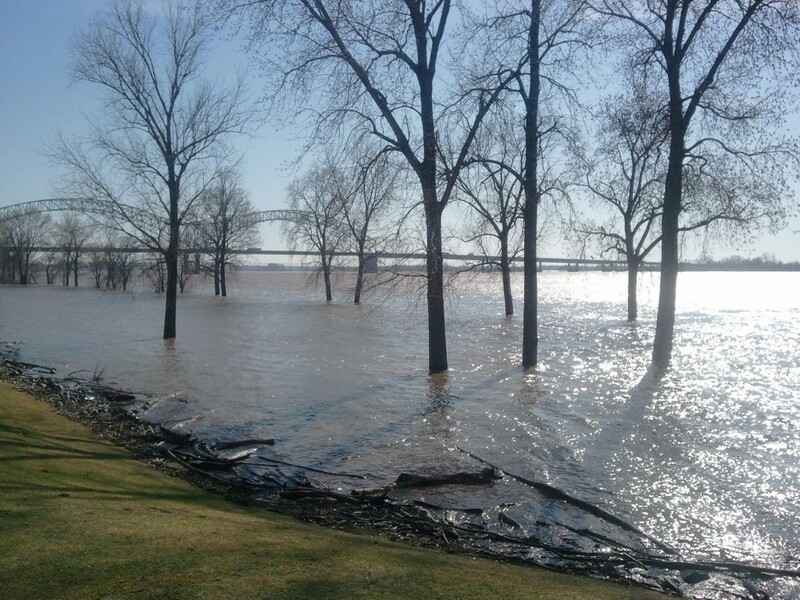 If you live or work near a swollen body of water, please exercise caution and remain at a safe distance from it, particularly if it is swiftly-moving, and warn children under your watch to stay away from rivers and creeks as well. One small mis-step could mean the difference between curiously watching the current and fighting for your life as you get swept downstream. Following the massive "Great Quake" in Japan on Thursday night and subsequent tsunami that affected nearly the entire Pacific basin, I posted some interesting images and links on Twitter and Facebook. I thought I'd take a minute to recap those if you missed them. First, helicorders in northeastern Arkansas detected the earth's movement halfway around the globe from Japan. 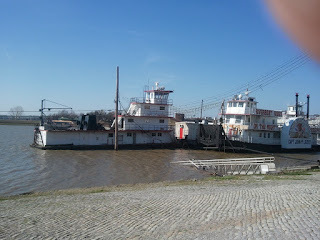 The first picture is from a "normal" day with almost no ground movement. (The lines read from left to right, top to bottom, and each line represents 15 minutes.) You'll notice at the very bottom right of the image, some shaking is detected - this is shortly before midnight Thursday night. The second image is from Friday. Wow! Though the earthquake wasn't "felt" in Arkansas, it was certainly detected by the sensitive instrumentation. 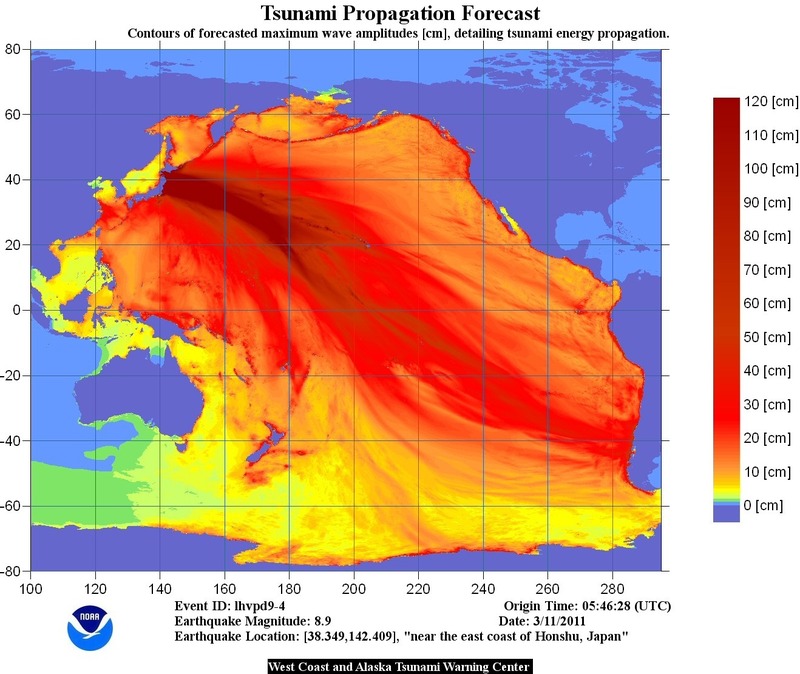 Next, an image from the West Coast and Alaska Tsunami Warning Center showing the propagation forecast of the tsunami waves (note, 30 centimeters = 1 foot). 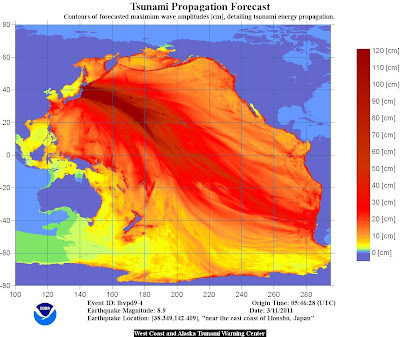 And to see that tsunami "in motion," check out the video animation below provided by the NOAA Center for Tsunami Research. 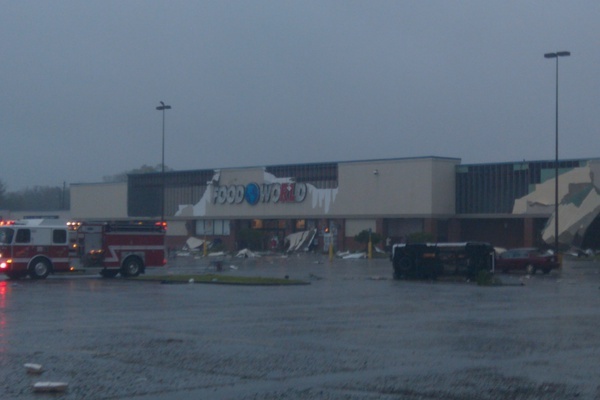 Thanks to Ryan Vaughan (KAIT-TV, Jonesboro) for digging this one up! It's eery to watch. As for the aftermath, here are a couple of links to photos and video I found and shared yesterday. There is just SO MUCH information and video/imagery that this is just a small sampling. If you have some favorites you would like to share, leave them in the comments so that I and my readers can check them out! Locally, we're in for a GREAT spring day! The sky will be mostly sunny with a high near 70 and a steady southwest wind today. A low chance of showers appears tomorrow as a weak cold front moves into the area. Additional cloud cover will hold temperatures back 7-8 degrees from today's readings. A better chance of rain and isolated storms will be possible Monday as an upper-level system moves through the region. Highs will be back in the 50s. Outside of a couple of small rain chances, next week will see a warming trend with highs into the 70s for mid to late week. 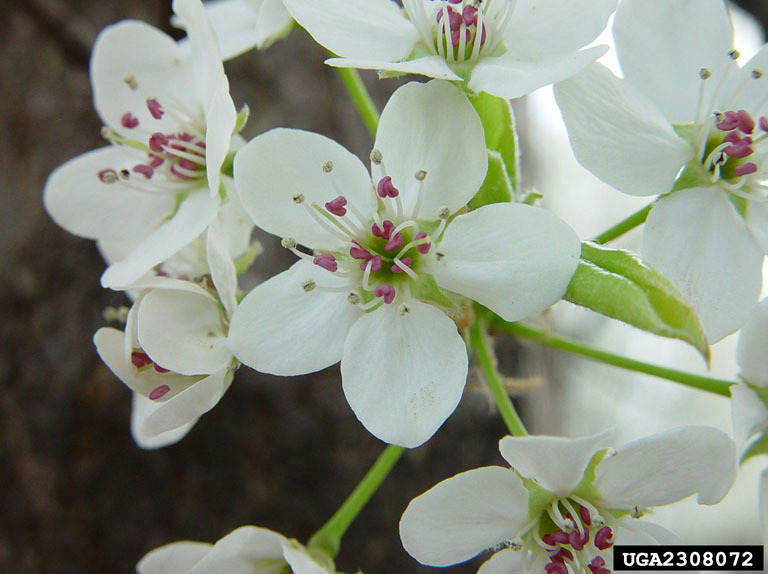 For those on Spring Break and staying in the area, it should be a good week to get out and enjoy Mid-South spring! For the complete MWN forecast, click here. Also, remember that tonight we "spring forward" to Daylight Savings Time. Move the clocks ahead one hour, change the batteries in your smoke detectors AND in your NOAA Weather Radio. Then, be ready to see the sun a little longer into the evening! ---- Stay up to date on the latest weather conditions and forecast by checking out MemphisWeather.net on Facebook and Twitter and our BRAND-NEW iPhone app! 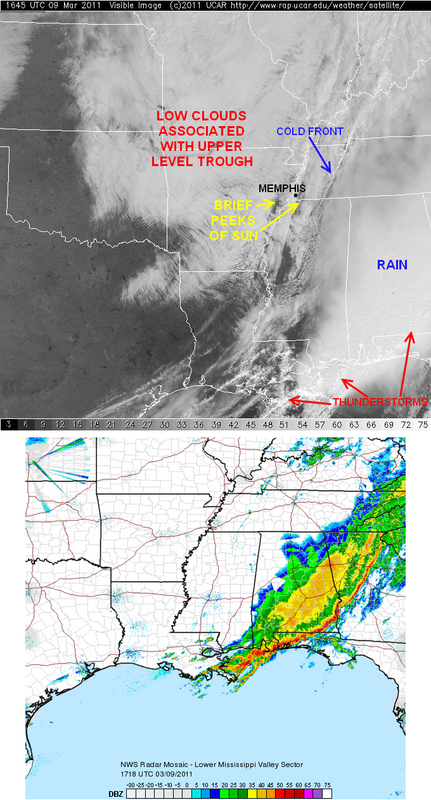 Below you will find the weather scenario the Mid-South is dealing with as of late Wednesday morning, as seen by radar and annotated satellite imagery. The overnight rain and thunderstorms have moved to the east and are covering the central Appalachians into northern GA, much of AL, and the FL panhandle. 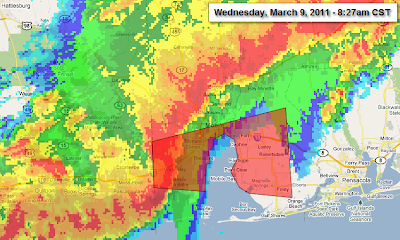 There is actually quite a line of impressive storms that have spawned tornado warnings over extreme southern AL and the panhandle of FL this morning. The cold front has moved east of Memphis. It's passage brought low clouds and some light rain showers during the morning rush hour. It is picked up well by satellite as a narrow thin line and can be seen in the same location on radar as a narrow faint line of rain from west KY into west TN. Behind the front, a few breaks in the clouds have brought peeks of sunshine this morning, but low clouds will be moving back into the region this afternoon, lasting through tonight. These clouds are in association with an upper-level trough of low pressure that commonly trails a cold front. This one has enough moisture to produce clouds and could bring some sprinkles or drizzle overnight tonight into early Thursday. I am expecting at least the morning hours on Thursday to be cloudy, with these clouds departing by afternoon, leading to a nice weekend! The complete forecast can be found at MemphisWeather.net. Radar and visible satellite imagery valid at about 11am CST. 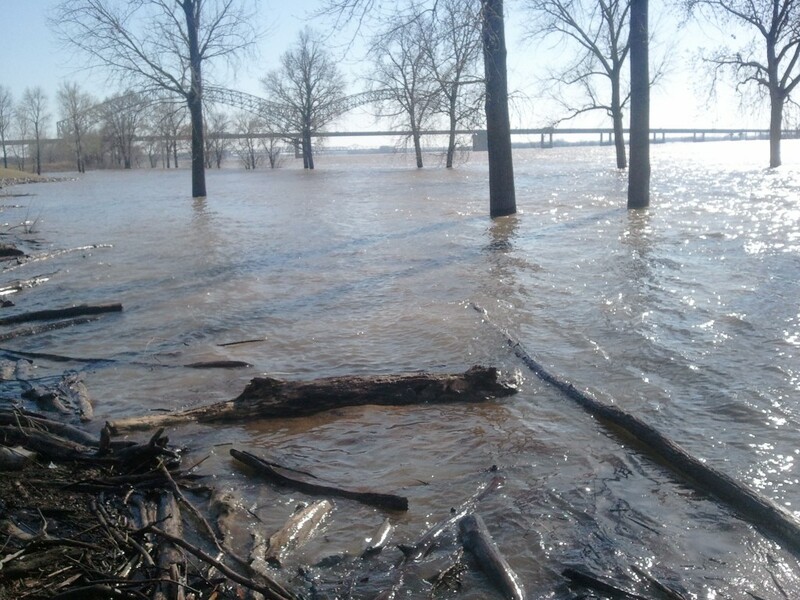 The National Weather Service has posted Flash Flood Watches for the entire Mid-South as a slow-moving frontal system approaches the region from Arkansas and low pressure moves along the front. This afternoon, the front resides over central OK but will move slowly east across Arkansas overnight before reaching the Memphis area around 10am Saturday. Strong to severe thunderstorms are possible to our west tonight, but are not expected to remain severe as they move east into our region. However, "general" thunderstorms are possible throughout the night and especially ahead of the cold front tomorrow morning. These storms will enhance precipitation totals where they occur and bring some cloud-to-ground lightning. The heaviest precipitation will likely occur in morning hours Saturday ahead of and just behind the cold front, though scattered showers will likely linger throughout much of the day. Rain totals will likely be near 2" for nearly everyone, though places that see more convective activity could see totals as high as 3"+. 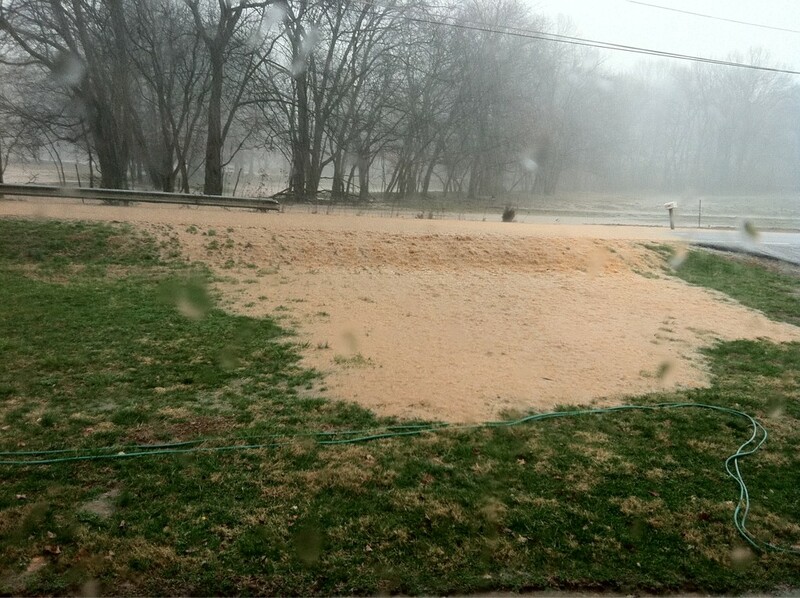 For this reason, the Flash Flood Watches have been posted. The map below shows average precipitation amounts for the period from 6pm tonight through 6pm Saturday. Many locations could see more than the 1.75" posted for the Mid-South area. After the cold front passes, temperatures will drop quickly into the 40s during the afternoon hours as wind shifts to the north and remains gusty. Sunday morning's low temperature will be in the 30s and it will barely reach 50 on Sunday afternoon. The next weather-maker arrives around mid-week. Click here for the complete MWN Forecast. 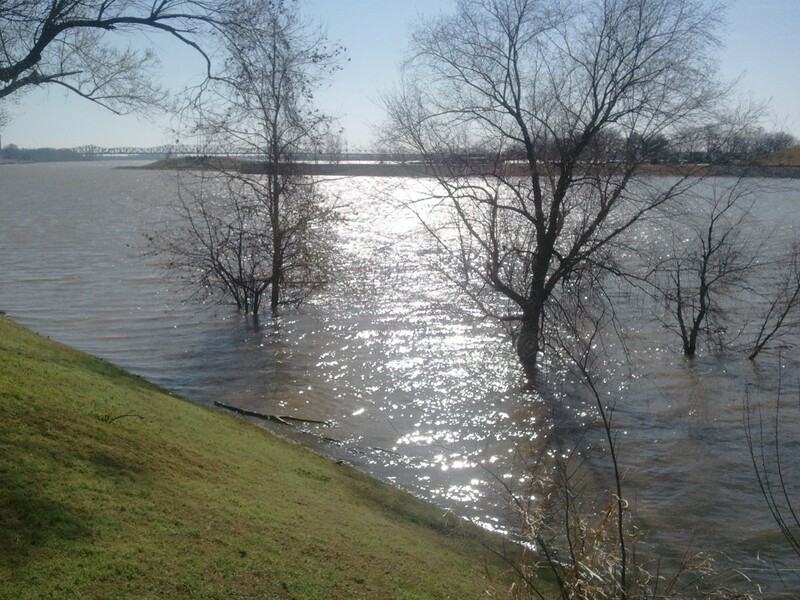 MWN encourages you to read over flood and flash flood safety tips in case water rises in your neighborhood, especially if you live in a flood prone area. Remember that it is hard to see flooding when driving at night, especially to gauge the depth of water crossing the road. 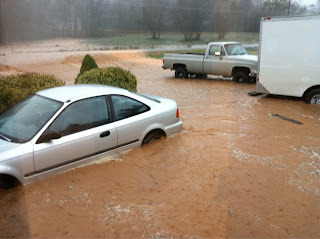 Do not drive into areas where water covers the road. It takes as little as one foot of rushing water to sweep a car off the road and it's sometimes hard to tell if the roadbed underneath the water is intact. "Turn Around, Don't Drown" is the NWS slogan. The pictures below, provided by Andrew Simpson, were taken 10 minutes apart on February 28th in East Knox County. 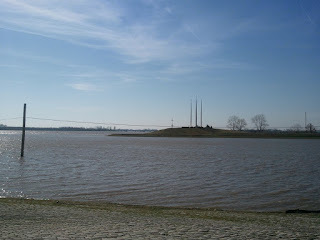 Water can rise VERY quickly! After a few days of nice weather, with crisp mornings and warm afternoons, the next weather system will be making it's way into the Mid-South Friday and Saturday. Showers and a few thunderstorms will be likely Friday as south wind brings in ample moisture from the Gulf of Mexico ahead of a cold front. High temperatures will be mild though - in the upper 60s. Showers and thunderstorms will continue into the night Friday night and at least the first half of Saturday with a slight chance of a few storms becoming severe, though the severe potential does not appear to be as high as last week's storms systems. The main threat with this system could end up being flooding as training thunderstorms (storms that move over the same areas) and many hours of rain could bring a few to several inches to some areas. The total rainfall expected with this system is shown in the image below - nearly 2" for much of the Mid-South. The cold front will move through during the day Saturday, bringing a temporary end to warm weather as temps plummet into the 40s by Saturday evening. Scattered showers could also linger into the evening hours. By Sunday morning, the rain will be gone, but it will be a cold day behind the departing system with lows in the 30s and highs struggling to reach 50. Another warm-up begins Monday before the next weather-maker arrives around the middle of next week. For forecast details, check out the Memphis forecast from MWN and stay tuned for later statements regarding possible severe weather and flooding concerns. 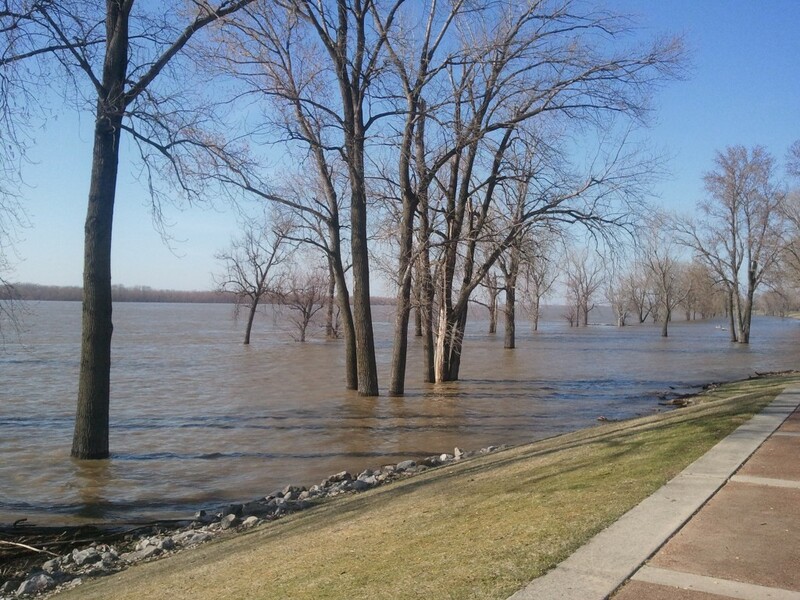 The muddy Mississippi River is beginning to stir up some issues for boaters, river enthusiasts, barge traffic, and many others over the past couple of days, including those who live and play near it's tributaries. 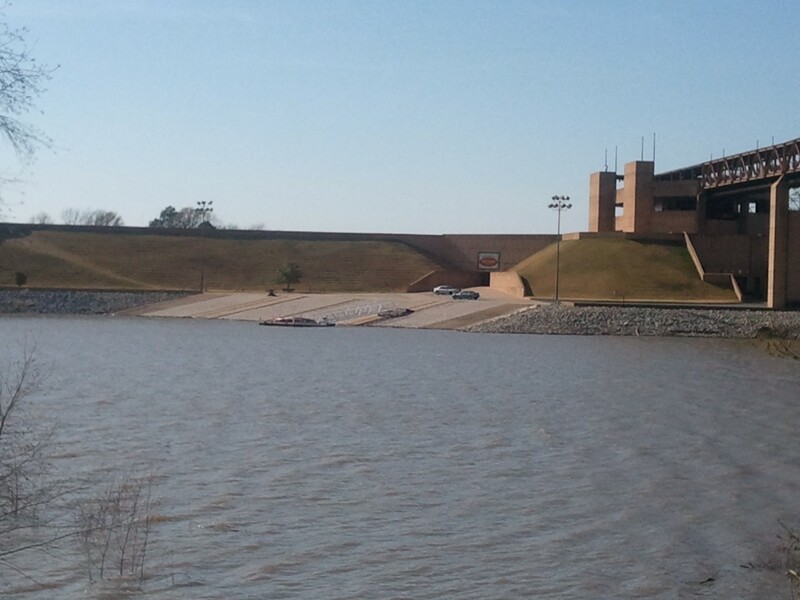 If you live or work downtown, cross one of the bridges, or have traveled over the Wolf or Loosahatchie Rivers, you may have noticed higher water levels this week. And the river and streams are not done rising! 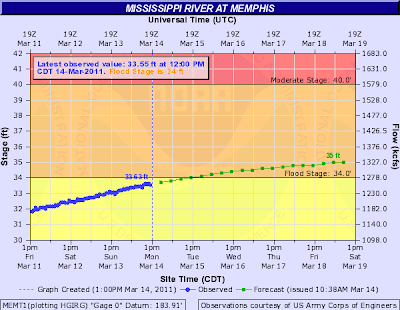 A Flood Advisory has been issued for the Mississippi River at Memphis due to recent heavy rain upstream (north) from Memphis, as well as winter snow melting upstream and flowing into the Mississippi or it's feeder rivers. 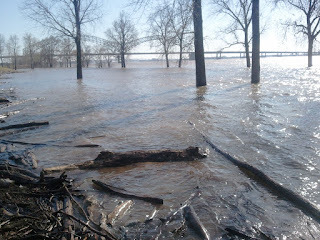 This morning's river stage at Memphis was 25.4 feet (above an arbitrary level chosen as "zero"). 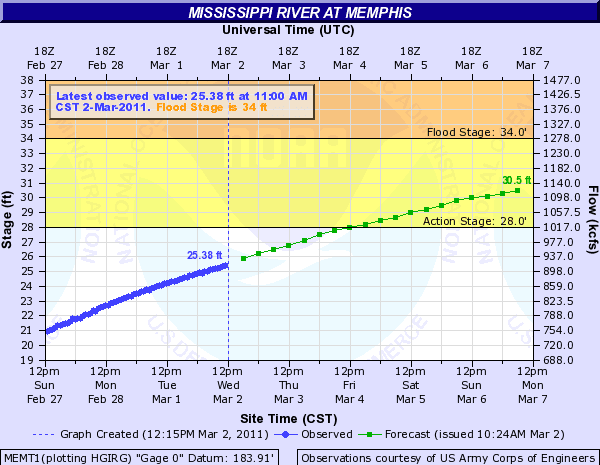 The river is forecast to rise above the "action stage" of 28.0 feet Friday afternoon, then reach 32.0 feet by a week from tomorrow. 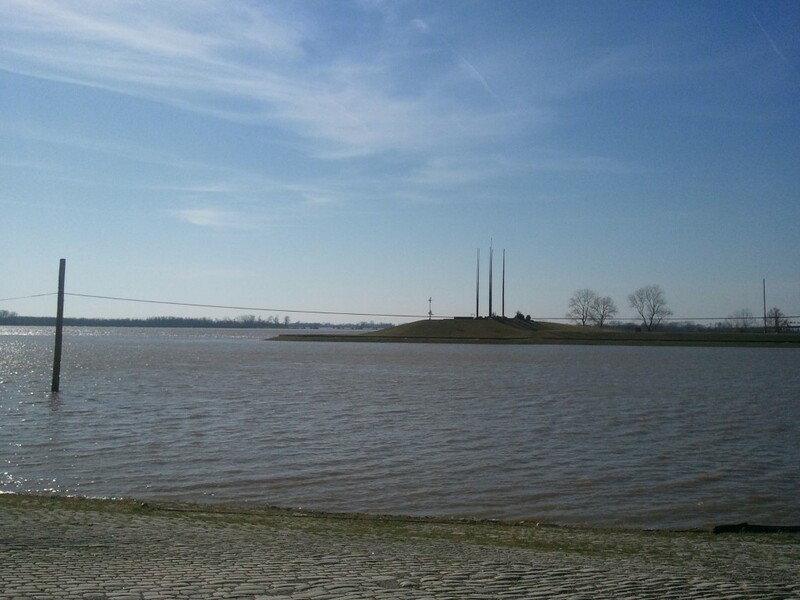 Flood stage is 34.0 feet and it's not out of the question that the river could go above flood stage sometime later in March. At 28.0 feet, flooding is occurring in isolated lowlands along the river, and at 32.0 feet flooding in occurring over unprotected farmland along the river, mainly on the Arkansas side.You will also notice that tributaries like the Wolf and Loosahatchie Rivers may begin to overflow their banks into susceptible lowlands. 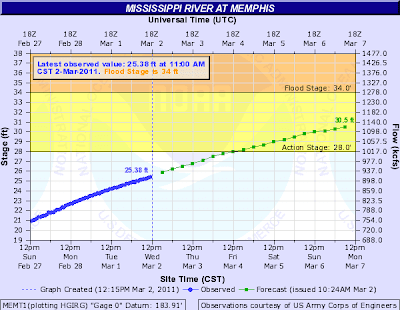 The graph below shows the forecast for the Mississippi River at Memphis (click for larger view), followed by the percentage of normal rainfall over the past 14 days. Notice in particular the 200-300% of normal rainfall seen over the Ohio Valley! 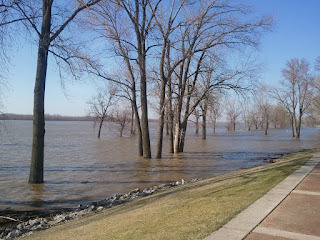 It's no wonder the river is rising!